You are here: Home / News / Business Services Employee Spotlight – Sherry Lescalleet! Sherry Smiling on the Job! This week’s Business Services Employee Spotlight is focused on Sherry Lescalleet. Sherry is the project supervisor for our contract with the Washington County Department of Social Services. She has held this role for 3 years and the customer could not be happier with her and her team. In addition to keeping the site spotless, she goes the extra mile to check in with the customer on a daily basis and has developed a relationship that turned this contract into a partnership. Sherry suffered from a barrier that is very common in our territory, lack of transportation. She was having a hard time finding a job without transportation and came to Goodwill in 2013 looking for a hand up. Through the services she received through Horizon Goodwill, she was able to land a job in our Hagerstown warehouse processing donations. Later that year she was hired as a custodian at a job site she could walk to. The following year, she was promoted to crew lead. 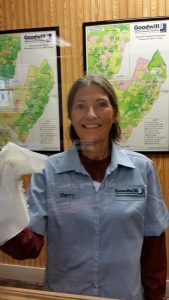 In 2015 she was promoted to custodial supervisor and in 2017, she took on additional responsibilities overseeing all of the custodial crews on our contract with Greenbrier State Park. Sherry Lescalleet, receiving the Unsung Hero Award from Assistant Director Bruce Massey at the WCDSS employee recognition event! Through all of these positive changes in her life, she was able to maintain steady income, get her driver’s license, and eventually her own car! With this, her barrier is in the rear view mirror! Her supervisor, Matt, is thrilled to have her on the team and said, “Sherry has proven herself time and time again to be a pivotal member of our team. She is always willing to jump in wherever and whenever needed. She makes my job more enjoyable.” We are so happy to have Sherry on our crew and she is a shining example of a Goodwill Success story.